The Sunset Woman’s Club will hold its annual rummage sale on Saturday, June 2, from 8 a.m. to noon at 1120 Latchford Ave. in Hacienda Heights. All proceeds will benefit the Delhaven Community Center, Downtown Woman’s Center and Pennies for Pines. 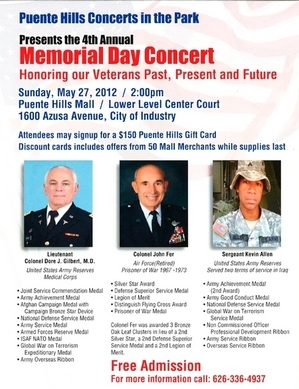 For more information, call 626-336-0604. Big Tobacco is at it again. Once more they are spinning falsehoods and fabrications about Proposition 29, according to Dr. Syed W. Bokhari, president of the American Heart Association, Inland Empire Division. He says the claim made by Big Tobacco that the funds generated from Proposition 29 will not be used in California is just wrong. It is ironic that this patently false claim is being delivered by self-interested out-of-state tobacco companies. Both the explicitly stated purpose of the measure and the composition of the commission ensure that funds will stay in California. In fact, the primary effect of raising the state tax on cigarettes will be to keep more money in California instead of shipping it to out-of-state tobacco companies. A recent UC San Francisco study concluded that Prop. 29 would keep $804 million in the California economy that is currently being exported to tobacco businesses and tobacco interests in North Carolina and Virginia. The American Cancer Society, the American Heart Association and the American Lung Association included very clear language in Proposition 29: Funds generated by Prop. 29 will stay in California. Time and time again Big Tobacco has been known to lie, even under oath. Why would now be any different? Prop. 29 was written by trusted organizations to benefit the citizens of our state, to find a cure for cancer and to keep kids from smoking. While the entire world will benefit if Prop. 29 passes and we find a cure for cancer, the financial benefit would be concentrated in California. Read more about his point of view in TOBACCO. It’s challenging enough to knock off an entrenched member of Congress in a primary contest. But California State Sen. Bob Dutton probably didn’t count on the fact that he would also be picking a fight with nearly a million Realtors. The Rancho Cucamonga Republican is running against Rep. Gary Miller, a 14-year GOP incumbent in the June 5 open primary. The National Association of Realtors political action committee and a super PAC funded by the trade association have spent more than $709,000 on advertising and direct mail supporting Miller, a Diamond Bar resident. A Hacienda Heights parolee is in custody on suspicion of setting a massive fire that destroyed the sanctuary of St. John Vianney Catholic Church in Hacienda Heights a year ago, authorities announced Wednesday. Gregory Yusuke Shiga, 34, was scheduled to appear in West Covina Superior Court for an arraignment Wednesday following his arrest by arson investigators Monday. However, the hearing was continued to May 30. Read more in Brian Day’s story ARREST. The San Gabriel Valley YMCA board of directors voted this week to shut down its Covina facility by the end of summer and move its headquarters to Hacienda Heights. YMCA officials said the organization can no longer afford to maintain the Covina building, which has operated as a YMCA community center with swimming and other exercise classes for 67 years. The YMCA will use pools at Los Altos and Wilson high schools in Hacienda Heights for swim lessons but they’ll only be offered in summer. 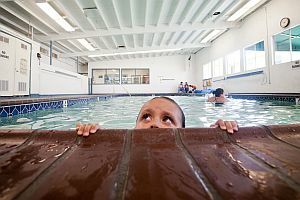 Read more in Steve Scauzillo’s story YMCA. A tip that marijuana was being grown at a house here led to the seizure of 400 pounds of the drug and about 1,000 marijuana plants with a total estimated value of $4 million, detectives said Tuesday. Two men were arrested as they left the two-story house in the 24000 block of Highcrest Drive on Monday night. Lt. Nick Tippings of the sheriff’s Narcotics Bureau said the house was under surveillance and that detectives served a search warrant Monday. About 1000 marijuana plants were found in various stages of growth in the upstairs rooms, the master bath and one bedroom in the first floor, according to Tippings. Detectives also recovered about 400 pounds of the finished product from the house. The culprits running the operation were stealing electricity from Southern California Edison to grow the marijuana. “We estimated the (electricity) theft to be $100,000,” Tippings said. He described the grow house as “pretty well-established” and thinks it may have been in operation for three years. And he believes the house was just used to grow the marijuana. While the American space shuttle has been relegated to air and space museums, the shuttle express program is alive and well at Los Robles Academy. 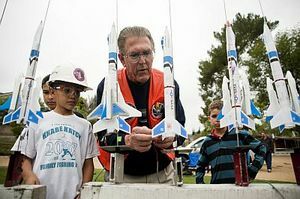 In fact, the young students marked the end of a six-week course on rocketry by launching their own brightly colored shuttles into the gray May skies over Hacienda Heights. The fourth- and fifth-graders chatted as they assembled their rockets in the vehicle assembly building, i.e. an empty classroom. Read more and see more photos in Rich Irwin’s story at ROCKETS. The Homestead Museum doesn’t own a time machine, but it might as well have on Saturday when it hosted a Victorian fair featuring period costumes, dances, performances and music. “You really do feel like you’re in a different time and place,” said Alexandra Rasic, museum director of public programs. The museum was once the ranch home of the Workman family, a group of pioneers who settled in the San Gabriel Valley in the 1840s. Check out the fun photo gallery at VICTORIAN. The Hsi Lai Temple is offering a special exhibit this weekend that presents a unique perspective of Buddhism’s journey from India to China by way of the Silk Road. Visitors will be immersed in medieval China as they peruse the exhibits of “Through These Doors: Connecting Past and Present, East and West.” The free multimedia exhibit promotes a better understanding of Buddha, focusing on Buddha’s birthday celebrations in medieval China. Visitors to the massive Buddhist temple may take docent-guided tours from 10 a.m. to 4 p.m. on Saturday and Sunday. Hsi Lai Temple will honor Buddha’s birthday on Sunday at 10:30 a.m. in the main shrine with a chanting service, followed by the bathing of the baby Buddha.